The Iowa State University College of Business has received one of the prestigious Innovations That Inspire Award from the Association to Advance Collegiate Schools of Business (AACSB), the accrediting body for business schools around the world. The Iowa State College of Business is the only school in Iowa, and one of only 30 worldwide, to receive this award. Dean Spalding at the Dean’s Conference in Miami, Florida. 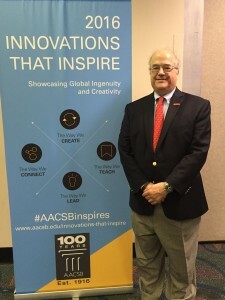 Through Innovations, AACSB identified ways that business schools provide value to society as they spearhead innovative practices in today’s ever-changing globalized world. The awards were presented February 1, 2016 at the 2016 Deans Conference in Miami, Florida. The award comes after one professor found a unique way to teach students about an international supply chain, a topic that is not always understood by many people. Working with a former colleague from Target, Associate Professor of Supply Chain Management Scott Grawe developed a course that quickly escalated into a life changing, international experience for 27 business students: participation at every stop along a real-life supply chain. Grawe took his students backwards through the supply chain. He started by showing students the products on Target’s retail store shelves. In this case, they narrowed their selection and followed a kitchen spatula from the shelf at Target in Ames, to the shipping docks in Los Angeles, all the way to the factory in China where it was produced. “We talked about how we get supply chain management students ready for a career with businesses such as Target, or any multinational company,” said Grawe. “Here in Central Iowa, there isn’t a lot of infrastructure to see from an international logistics perspective. Today, Grawe said he is happy with the experience, and especially pleased the college received the Innovations award, especially knowing how competitive the process was for colleges. AACSB’s most recent Innovations That Inspire initiative drew more than 300 submissions, from more than 200 institutions, across 35 countries around the world—a field of amazing ideas that were narrowed down to 30 innovations from 14 countries. A recent report in Transportation Journal lists Iowa State seventh in the world for “publication productivity in the Supply Chain Management discipline” from 2011-2013. Iowa State is the only college or university in Iowa that offers a supply chain management degree.